5 Reasons Your Domestic Business Should Go Global Today! Does this story apply in today’s global market scenario? Maybe! However, a century of industrialized world has changed a lot and businesses today need to take strategic calls on which markets to divest or invest. Most Small and Medium Enterprises in the emerging and developing markets have been occupied with domestic consumption and addressing complexities of growing business and fast changing 2.0 world. Does it makes any sense for SME’s in the emerging markets to pay attention to global markets? The answer finds itself in the grey spectrum and points towards thinking a wee bit long term than usual. 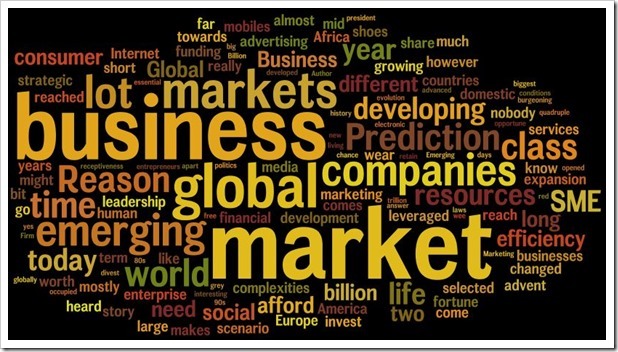 What are the prime reasons that your business should be gearing up for global market? Historically any big economic boom is led by a burgeoning middle class, baby boomers in America in the 70’s, almost 700 million + middle class between china and India in the 90’s and presently the regions of Africa, gulf, middle east, SEA and selected eastern Europe. If your business caters to the aspirational middle class population and has the IP and experience to market and sell beyond your domestic comfort zone then in a very short span of time you can triple or even quadruple your market size and carve out a leadership position in the years to come. Growing up in the 80s I remember advertising was a bit sacred medium. Only selected few could afford to properly advertise on two primary mediums available: print or electronic. The accessibility of Internet in the mid 90s opened new era of marketing and advertising, although it was still in infancy but you could market easily to millions other customers. The scene really changed with the induction of social media in the mid 2000’s, now a days with the advent of digital efficiency and reach of social media anybody can market themselves or their services to the world. You can test market your business to a sample audience in a different territory without spending much. There’s long way to go for a lot of us being really smart and efficient social marketers but it’s much more convenient and cost effective to reach out to potential market than ever before. Especially, considering mobiles have reached where even basic electricity and sanitation hasn’t. If you believe in evolution like I do, you would know that we humans share 99% or so of our DNA. This makes us fairly biologically identical BUT culturally we might be poles apart and the living conditions between developed and developing world are starkly different. Inherently, SME’s from the developing / emerging world are attuned towards cultural diversity, red tape, mild corruption, policy barriers, varied politics, loose labour laws and paucity of financial and infrastructural resources. Emerging economy companies need to drive business efficiency from chaos, which leads to flexible approach in lot of organizational and operational functions. Although, growing companies invest considerable resources in structural efficiency they mostly retain their organic warrior flavor, which is essential for global marketplace. A lot of entrepreneurs I know (me included!) had tough time sleeping when whatsapp was sold for $19 Billion. A four year old company with 45 employees earned approx. worth of 10,000 average SMEs from developing countries. Business life and Human life span is exactly going in opposite direction. Average human life span has gone from 35 to 75 in last 100 years. The business life span has however been cut short drastically with the advent of technology, free market, crowd sourcing / funding and internet. External funding, Merger & Acquisition are not happening in the land far – far away but in your neighborhood. Bandwidth, agility, leadership, Innovation and receptiveness to change are celebrated like no other time in the history. Global Business expansion keeps companies on their toes as they go about dealing with the complexities and challenges, which comes with it. Your business has a better chance of survival in long term if it spreads itself out in a stipulated time which can be leveraged at a opportune time. Pepsi, Coke, McDonald’s are doing it why shouldn’t you? Prediction: By 2025 approx 50% of the gross business for fortune 500 companies will come from emerging markets. With emerging markets averaging 6.5 – 7% growth year on year, any large enterprise just can’t afford to not be present there. SME’s need to be more pro-active and bold when it comes to expanding globally even though it won’t be at a scale of a large enterprise initially. Large enterprises commit huge financial and human resources for market development mostly from a 5 – 10 year perspective for returns. SME’s might not be able to afford due to scarcity of resources but with strategic partnerships and JVs a lot can be leveraged. Affluent and educated middle class in key emerging markets are keen to establish lot of proven businesses form oversees. Does your product or service has viability in global market? If yes, please share your biggest barrier or motivation for global business expansion. Why single view of the customer is a myth in India?